No one forgets how to ride a bike. They just forget that they should be riding a bike. That’s why Highland Park’s Bike Walk Advisory Group (BWAG) teamed up with Highland Park School District 112 to encourage students to walk or bike to school. Inspired by the national Bike-Walk to School Day, members of BWAG contacted every elementary and middle school principal in town. The ask seemed simple: urge students to get to school under their own foot power. Seven of the thirteen principals jumped on board immediately, recognizing the benefits of promoting the event. Originally scheduled for October 4, bad weather compelled the schools to postpone the event until October 13. With clear skies, the day was a success. Hundreds of students arrived at school on foot, on bikes and even on scooters. BWAG had a few goals in mind in promoting the event. As a group, they’re committed to improving Highland Park’s national bike friendly rating. They focus on improving signage and infrastructure. They also strive to increase the number of residents who walk and bike throughout the city, not only for recreation, but also as a viable mode of transportation. 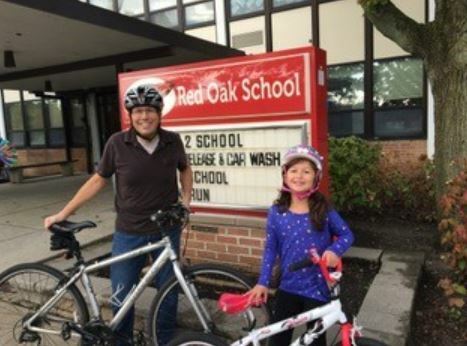 By coordinating their efforts with the schools, they also help educate an entire generation about bike safety, safe routes and green transportation. The participating schools included Braeside, Indian Trail, Oak Terrace, Wayne Thomas, Red Oak and Sherwood elementary schools, and Edgewood Middle School. The event even garnered coverage in the Chicago Tribune, which highlighted some of the safety messages students received as part of the event. At many of the schools the bike racks were full, and the carpool lanes slightly diminished. Every participating school expressed interest in hosting the event again next year. It’s a strange concept to grasp, that walking or biking to school is so unusual that it needs to be promoted. Yet that is the reality for too many school-aged children. The success of Highland Park’s first Bike-Walk to School Day hints that maybe more students will feel empowered to get to school on their own two feet. That’s the goal. This guest blog post was written by Sally Higginson from the Bike Walk Advisory Group of Highland Park.